The Art Association of Oswego announces the opening of a special two-day only exhibition called Oswego Generations Exposition on Friday, September 25th from 6-9 pm. The exhibit will showcase artwork from generations of Oswego artists, young and old, and will feature the work of Fulton-born artist Don Gillespie. As a youth, Gillespie participated in area art shows before moving to Florida and becoming an aerospace artist. He developed an interest in past Oswego artists when he began researching his great grandfather, W.R. Shayes. Shayes owned an art gallery in Oswego during the late 1800s. Shayes’ gallery displayed works by Charles H. Grant and James G. Tyler. Tyler and Grant were both born in Oswego and went on to become nationally acclaimed marine artists. Tyler Hall on the SUNY Oswego campus was named after James G. Tyler. The Generations show will feature a the recently finished 9 foot painted reproduction of a C.H. Grant painting, entitled “At the Mercy of Neptune”, a painting that was hanging in Shayes’ gallery before it burned in 1896. The show will include other paintings by Gillespie, plus other original works on loan that were painted by Grant and Tyler, paintings by Gillespie’s talented assistant Michael Wills and other Oswego artists including artworks by children that Gillespie has worked with in workshops at CNY Arts in Fulton. Gillespie explained, “This is a very rare event that will span 3 centuries. To see all these paintings together in one show of past present and future artists from Oswego County will be a real treat”. 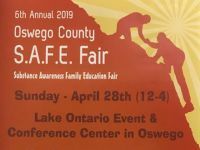 Gillespie hopes that this show will inspire the artists and art organizations of Oswego County to work together and continue this great tradition. The reproduction may also help to locate the original “Neptune” painting, and he is asking anyone who has a Grant or Tyler original to contact him or the Art Association to consider including it in this two-day exhibit that celebrates local artists. Gillespie spent his career painting images of state of the art weapon systems, aircraft and spacecraft. Gillespie’s paintings have been displayed around the world including New York, London, and Paris. His works can be found in many NASA facilities, The Air Force Art Collection, as well as corporate and private collections. He has been sponsored by Winsor & Newton and other leading philanthropic organizations. This event is free of charge and open to the public. Refreshments will be served at the opening reception. The Exhibit will also be open from 10am to 4pm on Saturday, September 26.